On this page you'll find guidelines for attending GMARS star parties, but many of the guidelines surrounding things like lights, lasers, pets and clothing, apply to any star party—whether it's at GMARS, Nightfall, a star party hosted by another club, a star party in another state or even in another country. For more information specific to GMARS such as location and layout, click here. Star parties at GMARS are typically scheduled for Friday and Saturday nights nearest the date of the new moon. This, of course, is to maximize dark sky time without the bright glow of the moon, which washes out views of the Milky Way and other galaxies and nebulae. Since new moons don't always occur on weekends, there will often be a crescent moon that sets in the early evening or rises in the early morning. We encourage you to arrive before dark. This is not always possible, especially at the end of a long work day with southland traffic. You are allowed to arrive whenever you can, but if you come after dark, please be sensitive to keeping your vehicle lights off. See the LIGHTS section below. Many people stay overnight for both nights, some stay for just one night, and others stay for just a few hours and leave. You may arrive and depart as necessary. We only ask that you take proper precautions and considerations for both light intrusion and safety. You are greatly encouraged to seek the assistance of another when leaving—someone walking next to your car with a red flashlight may be able to see obstacles you can't. It's also appreciated if you quietly announce your planned departure so others can shield their eyes or finish an exposure. Friday: Star party activities typically begin in the late afternoon before the sun goes down. Attendees begin arriving and start setting up their equipment. As sunset approaches, you'll find most attendees double checking eyepieces and/or cable connections, taking flat field images, and other final preparations. On a friday night, dinner can be accomplished by preparing a meal for yourself in the kitchen, in your RV or on your camping equipment. You can also head into town to dine at a restaurant or to pick up some fast food or a pizza. When the sun goes down, we get down to fun (or business, depending on your outlook). Many will call it a night after a few observations, but there are plenty of nutjobs, I mean, dedicated folks who stay up well past midnight or even until the sun rises. Saturday: Those who attended the previous night will probably try to sleep in for a while. The smell of coffee typically fills the house and the telescope field. Daytime activities are varied and can include hiking the local desert (if it is not summer), reading a book or magazine, processing images from the previous night, flying a kite, or working on the GMARS clubhouse and surrounding facilites. Another perfectly acceptable daytime activity is more sleeping. Should you come across someone sleeping, please leave him or her undisturbed. Since the family room and kitchen can be somewhat busy during the day, they aren't good places for napping. The bedrooms in either clubhouse (east or west) are great places for catching some Z's. Saturday (continued): As the day progresses, more people will start to arrive (Saturday night usually has more attendees than Friday night), and a couple hours before sunset we'll begin preparations for the world-famous RAS Star-B-Q! It's a potluck-style dinner where the club provides some form of protein (usually hot dogs or hamburgers, maybe chicken or tri-tip on special weekends) and the fixings. Attendees provide side dishes, beverages, chips & dips, and desserts. There is no charge for the meal, but donations to the club are certainly welcomed and help us pay for the provided amenities. Then we wait for it to get dark and for our food to settle. After that, it's star party time! Sunday morning: If they haven't left already, visitors might hang around a bit while they prepare and eat breakfast and enjoy some coffee. Most will likely pack up their equipment and head out first thing in the morning. The telescope field is usually cleared by about 10:00AM. Any help you can provide, however small, with cleaning up and leaving GMARS tidier than when you arrived, is greatly appreciated. Parking is available on-site in designated areas. 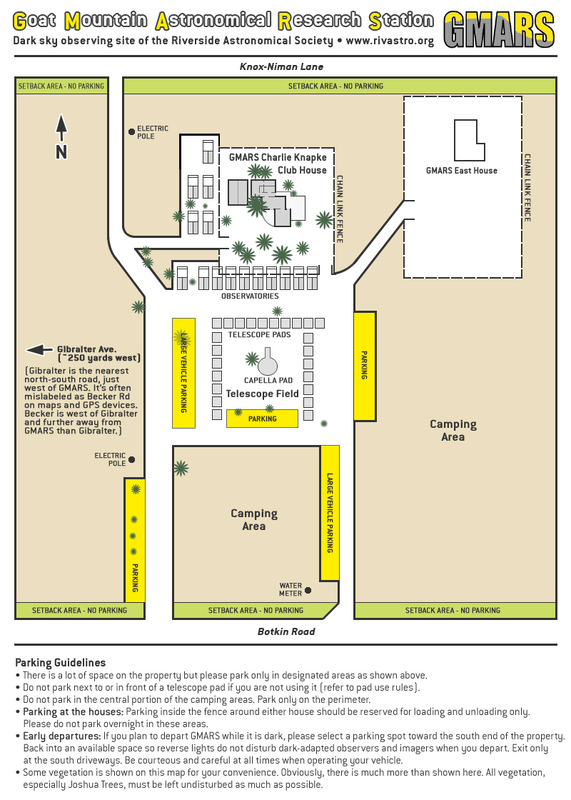 Click here to view the GMARS site map or click here for a printable PDF version of the site map. If you must leave early, please park facing the exit so you do not have to use your "backup" lights. Amateur astronomers know that light impedes night vision—one's ability to detect faint objects in the night sky. For this reason, we are careful to use only dim, red flashlights after sun down. The human eye is least sensitive to red light and it therefore impacts night vision the least. All star party attendees are encouraged to use only dim, red flashlights. If you have only a regular white flashlight, the club usually has red film that can be taped over it. Please ask a club member about it. Any emergency trumps our desire for night vision so use white light as needed in urgent situations, and please alert others immediately to any emergency. It should be noted that even red light can affect one's night vision and observing. Any color of light, if it's bright, aimed directly at one's eyes, or not well-filtered, will destroy a dark-adapted individual's night vision. Flashing lights can be very distracting, and if bright, will affect night vision. Flashing lights may be used to warn aviators of tall structures, but at star parties we're not flying planes. In general, it is best to keep all lights off (even dim lights), unless they are absolutely necessary for walking or reading observing charts and books. It's not uncommon for new visitors and attendees to shine flashlights at people's faces. Please remind yourself and your young ones to always point the light towards the ground, and use it for walking only. You do not need to have a light on if you're standing still or waiting to view through a telescope. Better yet, control the flashlight for your children. Automobile lights can be another problem. The time to learn how to control your vehicle's lights is before you come to the star party. It is very difficult to learn how to control the lights in the middle of a dark night at GMARS. Experiment, look in the manual, or talk to the dealer. Most cars have a dial or switch either on the dashboard or on the interior dome lights that allow you to shut off the interior lights even when a door is open. Other drivers may have to locate the switch, fuse, or relay that controls these lights. Some cars have daytime headlights or automatic headlights that are always on. Sometimes these can be shut off by pulling up one or two notches on the parking brake. If they cannot be controlled this way, there may be a convenient override switch or easy-to-use fuse. If not, the driver has a few choices. One could just forego driving at night (preferred). Or, one could tape some opaque (light proof) material over the lights. Another alternative is to park down the road. IF YOU MUST DRIVE WITHOUT LIGHTS and you are unfamiliar with the site, have someone help by walking along to guide you with a red flashlight. We recommend you park at the entrance (with headlights OFF), and walk in with a dim (red) light and ask someone for assistance in parking your vehicle. Although we refrain from using lights after dark, we are also concerned about your safety and the safety of others. We're not going to tell you not to use your car alarm when at our star parties, but don't use your car alarm (or at least be sure you know how to use it and are around to turn it off should it be triggered). Lights should be controlled on the entire site during a star party. Recreational Vehicle windows should be fitted with opaque coverings, and care should be exercised to ensure lights are off when opening vehicle doors. Tents are not light-proof, and a typical flashlight or camp lantern in a tent will ruin night vision for those outside. And for those new to "camping" at a star party, it should be said that it isn't really camping as you may be used to, since campfires are not allowed. Finally, please ensure your laptop or netbook is prepared for the darkness by using either a full-screen red filter or a laptop tent. Green lasers are great tools for pointing out stars, asterisms, and constellations to beginning amateur astronomers. They're also very bright, can be misused easily (intentionally or unintentionally) and can ruin long-exposure astrophotos. As a matter of common sense and courtesy, we ask that green lasers (and any other color of bright laser) be used only for informal sky tours in the early evening. Use it sparingly and be prepared to put it away if someone asks. Whether you're asked to stop using it or not, please stop all laser use after astronomical twilight. Cost? What cost? At GMARS, it's all free for everyone—member or not! There may be a donation bucket at some events, but nobody keeps track of who drops anything in the bucket, or if anyone is a member or not. Your camping supplies, food, and other personal expenses are your own. At GMARS, there is no fee for camping. The RAS does run or sponsor some events not held at GMARS, like Nightfall, that are not free—there may be lodging or attendance fees. But if it's a star party at GMARS, it's free. GMARS consists of 10 acres of land, made up of two adjacent 5-acre lots each with a house. The house on the west lot (known as the Charlie Knapke House or the main house) has a garage, full kitchen, living room, 2 bathrooms and 1 bedroom. The house on the east lot has a living room, storage rooms, 1 bathroom and 1 bedroom. The beds in the bedrooms are available on a first-come, first-served basis. Simply arrive early and place your sleeping bag, blanket, duffle bag or some other belonging on a bed to show that it's reserved. Please bring your own pillow and sleeping bag or other bedding. The telescope field and parking areas are graded and relatively level. We have a designated camping area for tents but you are welcome to set up a tent adjacent to your vehicle and/or telescope so long as it doesn't take up needed parking space or interfere with walkways or roadways. Limited 110v AC power is available on the telescope field for scopes, computers, battery chargers, and similar devices. The electrical outlets are not to be used for space heaters, RVs, electric/hybrid vehicle charging or any other high current uses. There are no RV hookups. Please be aware that the desert sand in the Landers area does not pack well. Care must be taken to drive on graded surfaces and not get stuck in the soft sand. Please keep your vehicle adjacent to the telescope field or other "developed" areas. Do not go off-roading on GMARS property. Fires, whether for warmth or cooking, are NOT permitted. You are free to use the kitchen in the main house or your own propane/gas camping stove. You are free to go to GMARS whenever you like, whether it is a weekend, weekday, star party or not. The main house is surrounded by a locked fence, which is unlocked only when a key-holding RAS member is present. There is typically no access to the house and its amenities except during organized star parties and other special events. Electrical power is available at the concrete pads at all times—again, no hooking up your RV to the electrical outlets! We do not encourage playing or listening to music during the evening star party. If it's something you just have to do at a star party, please check with your immediate neighbors first and keep volume levels extremely low. Do not smoke or drink alcohol in or around the telescope field. Children and pets must be monitored. No one should be running on the property, especially at night. You are expected to pick up your pet's waste. Keep your vehicle speed to an absolute minimum when entering and exiting the property. Members and guests typically wait patiently for their turn to look through a telescope. Attendees with telescopes are expected to allow others to look through their scope (unless they are involved in a specific observing or astrophotography program). We encourage everyone to conduct themselves courteously and to remember that the house and property belong to the club and the membership. It does not belong to any one individual. Please be respectful of the property, the houses, and of others and their property. Star parties should be fun for everyone attending. They are social events where the individual is secondary to the group. Pets are welcome, but must be supervised and under control. Whether or not they should be on the telescope field at night depends on how well they behave but, in most cases, it's probably best if they are kept off the telescope field at night. If someone were to get caught in a dog's leash or step on a dog in the dark, no one will be happy (the dog will probably be least happy). It's also not unheard of for an excitable dog to knock an eyepiece to the ground. That's not fun. Another potential problem with pets on the telescope field at night is the depositing of "land mines." That can ruin a lot of peoples' fun if it gets tracked into an observatory, someone's car, or into the house. The reason to have a star party is to gather with others and observe or image the night sky. If you have equipment of your own, absolutely bring it! If you want help setting up, just ask—you will find some volunteers. If you do not have your own equipment, feel free to visit with any person on the field and ask what they are doing (one of the more popular pick up lines is, "So... what are you looking at?"). In very rare instances you may run into somebody who is simply working too hard at something to take time to visit with you and have you look through the telescope. This is true for astrophotographers or those engaging in a specialized observing program. These things can take a lot of planning and concentration. However, most people on the field would love to have you look through their scope; just be friendly. You never need equipment of your own to attend a RAS star party. If you are new to this, be aware that equipment should be handled with the same care you would give any delicate instrument like a fine camera or good crystal. Generally, equipment is not fragile like these items can be, and won't break when touched. However, since the optics magnify so much, a simple touch can disturb the view, and may even move the scope so that you cannot see the object. So, do everything gently. Winters and summers at GMARS can be extreme. In winter, the temperature can easily drop below freezing shortly after sundown. Low temperatures can hover around 20-30°F (it even got down to 12°F on a winter night in 2013). In summer, temperatures routinely top 100°F and it may not go below 80°F over night. It is essential that you check the weather prior to heading out to a star party and that you adequately prepare in terms of clothing. During the winter, be sure to include long johns, hat, scarf, parka, gloves, heavy socks, and good shoes for the night. Wool, silk, poly, fleece, down... all good materials to keep in mind for the winter months. Dress warmly from the beginning of the evening. Once the body gets cold, it can be difficult to get its temperature back to a comfortable level. Then there's summer. As mentioned above, it can get extremely hot and relief isn't always in store when the sun goes down. Wear shorts and loose clothing. Flip-flops are not recommended as there is always potential for scorpions and snakes. Bring a light jacket and long pants just in case. In addition to the summer heat, monsoonal moisture is relatively common in the summer months. If attending a star party during July through September, keep an eye out for rain and thunderstorms. When checking the weather before heading out, keep in mind that your local weather in LA or Riverside can be quite different from conditions at GMARS. Landers doesn't get a marine layer and it can often be clear when much of the southland is covered in clouds. On the other hand, you may encounter wind, rain, and/or extreme heat or cold that wasn't present or forecast at home. It's always best to check the GMARS Weather page, its weather cams, and the forecast before making plans to head out to GMARS. We don't officially cancel star parties due to weather, but you may arrive and find no one else there... which means you probably won't have access to the house and its amenities. So it's in your best interest to stay on top of the weather and plan accordingly. On a star party weekend, you can call the site to get the latest conditions from someone who's there. The GMARS phone number is: (760) 364-1952. If you have never been to a Star Party before, are visiting for extra credit in your astronomy class, want to know what kind of telescope to buy, are having trouble with your equipment, or whatever—just come on out during a star party and ask away! Just as with any group with diverse members, we have those who are quiet and prefer to keep to themselves. However, the vast majority of members are more than willing to share with you whatever they know. They may even provide you with more information than you were ready to accept. The mission of the Riverside Astronomical Society is to "Bring the Joy of Astronomy to the Public." You're more likely to find that joy if you ask for it. First timers especially should attach themselves to somebody and simply spend the evening around them. If you would like such a mentor, just look around. The best candidates will already have a few people standing around looking through their scopes. Simply join in and have fun.